Interior Design: Krisha's Residence at New Delhi, by Spaces Architects @ka - ArchitectureLive! This house dates back to 45 years and is for one big family. The architect want to revamp his apartment within very short period. So from dismantling things to designing and getting it executed on site it takes only 35 days to complete the interiors. Basically we try to keep together two worlds, the one of the old and the one of the new, in a balance able to guarantee the identity of both of them. Light and shadow are kept together in their ambiguity and plurality, without sacrificing the reasons of one at the expense of the other. 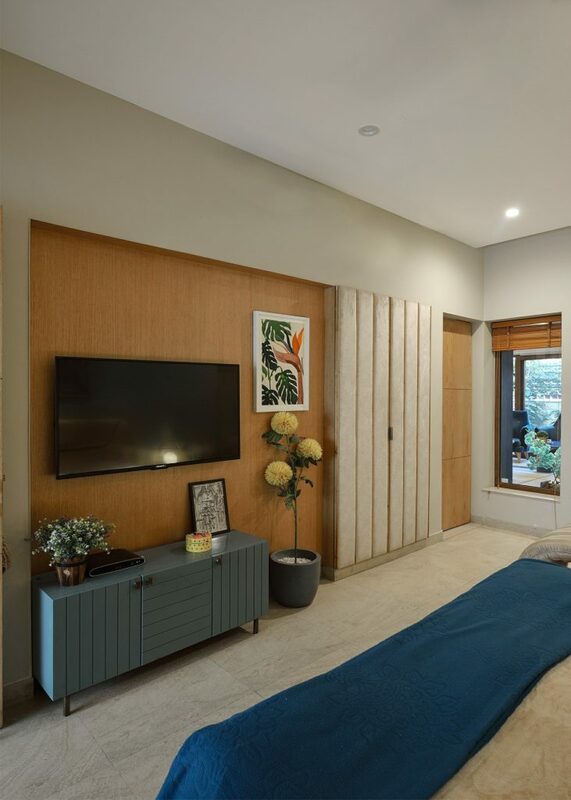 The very first thing that user experience is the entry lobby area and than moves throug the bedroom to family loung where sits the dining table and drawing area. Kitchen area remains as it is where it used to be. There’s ambiguity of natural light into space which penetrates through green area which acts as a breathing space for the residence. Color is an integral element of our world. The concept behind this artistic residence is to smartly use the colors. 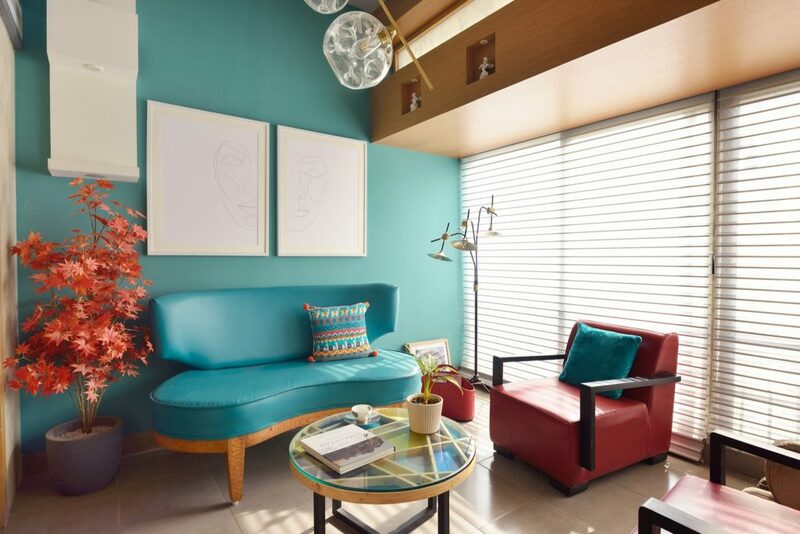 The impression of a color and the message it conveys is of utmost importance in creating the psychological mood and ambiance that supports the functions of this house in a positive manner. Material palette has been wisely chose with the use of pastel colors and oak veneer. 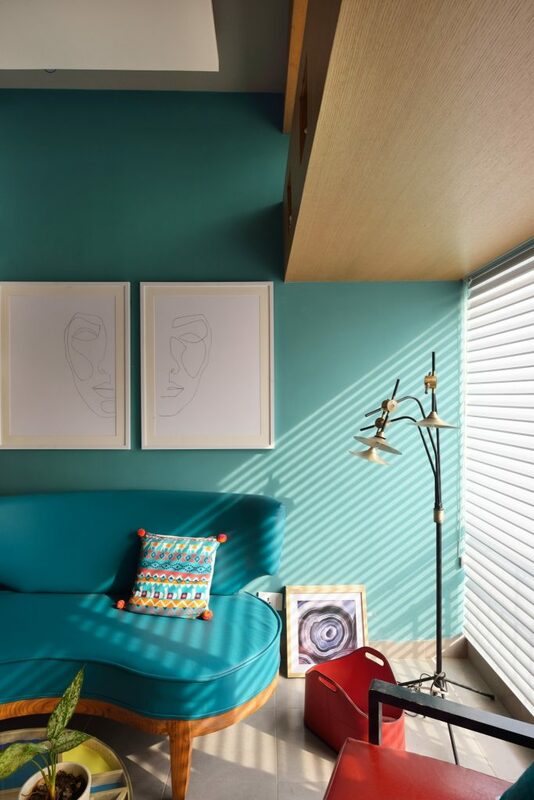 The first expressions that strikes the user is the turquoise color wall upon which sets the painting and a contrasting sofa in same color. On right side there’s a red colored sofa adding another color to the dimension. 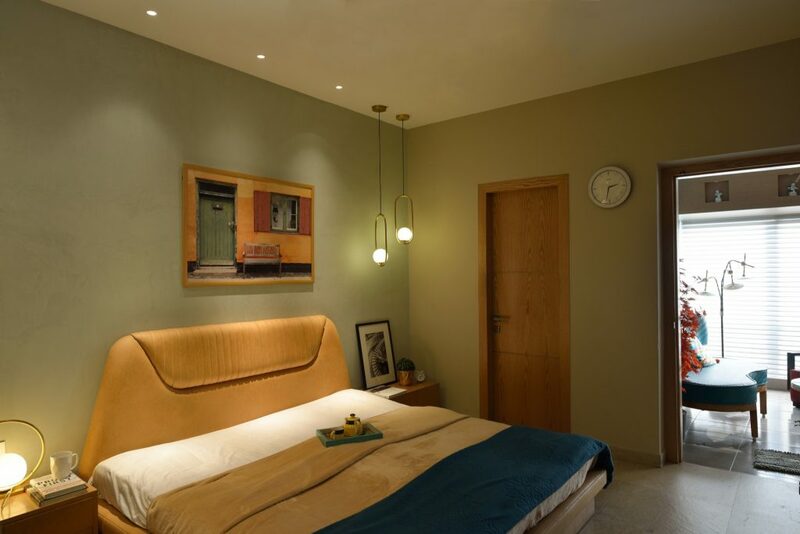 Keeping the color palette very subtle and minimal for the bedroom and encompassing it with paintings sets a perfect balance between the function and aesthetics. Emphasis has been given on each and every detail even the shutters of almirah has been digitally printed on canvas adding an element of art to the room. Natural green has been introduced in different areas increasing the air quality of space. The complete journey is like a story in this house and with each step you gain a new perspective. Representing the same two walls of family lounge has been painted with two very contrasting colors deep blue and baby pink. So again its very interesting to see things moulding with each other in a harmonic way. Dining table is custom designed with a pattern of black and white stone on its top contrasting the baby pink wall. Along the blue wall a yellow colored sofa is being placed just next to it giving it a bold yet soothing effect. Green area is an essential part of the family lounge which brings the filtered air and light into the space. This home is a treasure trove of paintings, canvases from translucent blues and greens to deep shades of pink and ochres. So it comes as a surprise to discover so many paintings. Each painting is handpicked by architect himself and has been conceptualised with the aura of the space.